Grundy Park in Jersey City doesn’t just hold an attraction for people who want a spectacular view of Lower Manhattan. 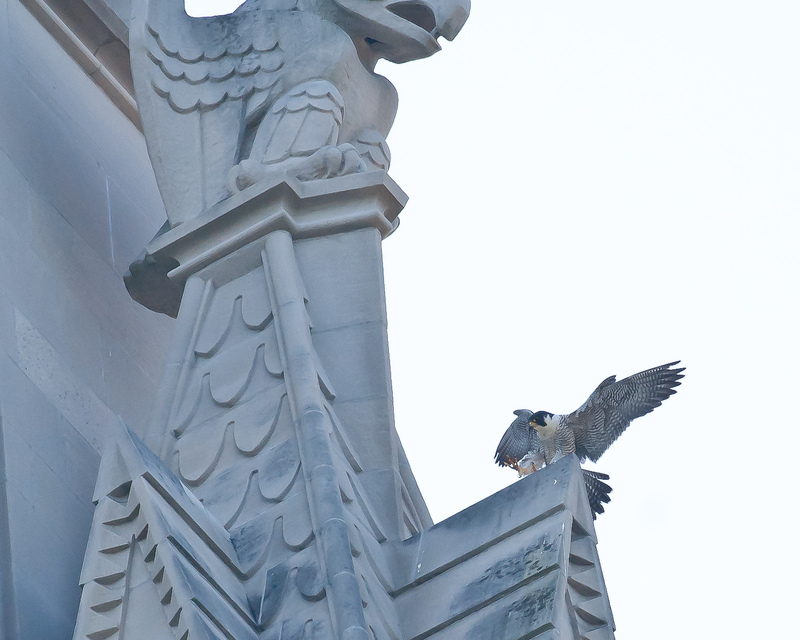 Peregrine falcons also find it the best place to live in the metro NYC area . 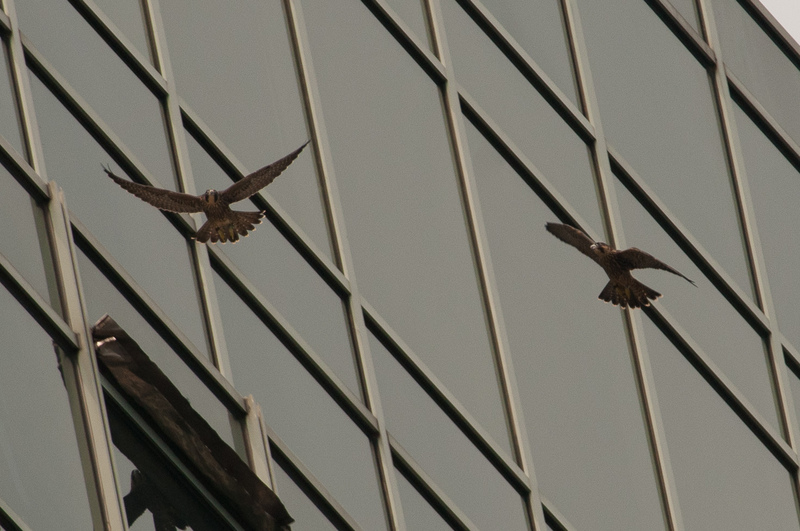 The two surviving male fledglings, Buzz and Frank, who started out at 101 Hudson on May 3, 2012, are expanding their flying and eating space. 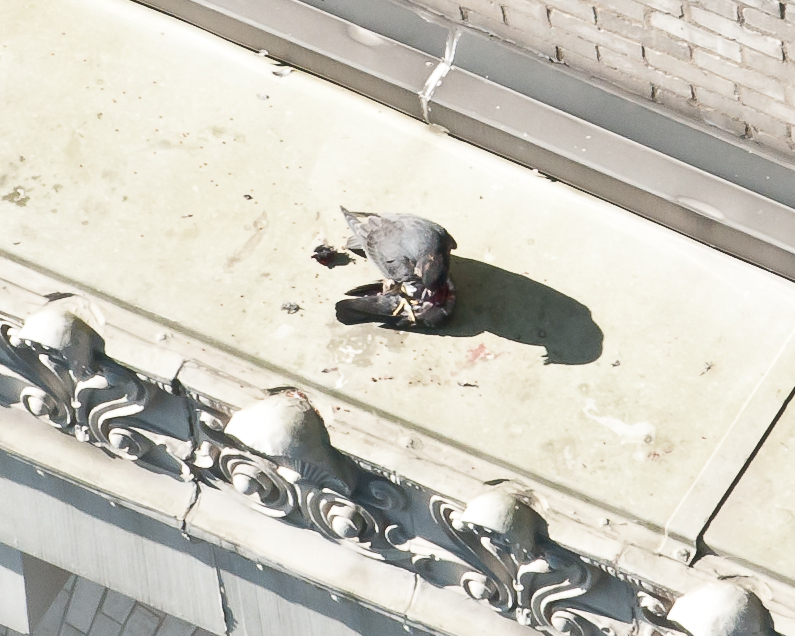 Residents in the buildings won’t have to look at dead pigeon carcasses outside their windows for much longer. In about four weeks, the adults will give the kids the boot. Athena checked us out. 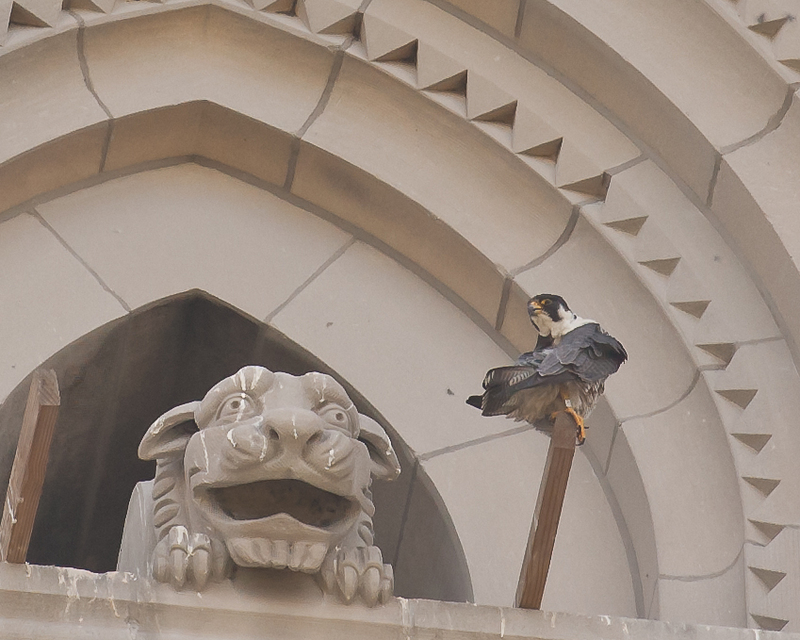 She decided we were OK. No talons in the head this time. 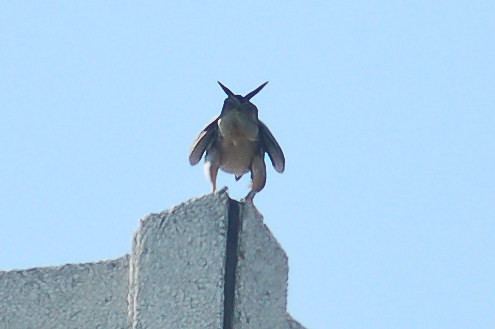 One fledgling sees breakfast being delivered. MacPigeon for breakfast is on the menu. The other one had the Kid’s Meal, too. 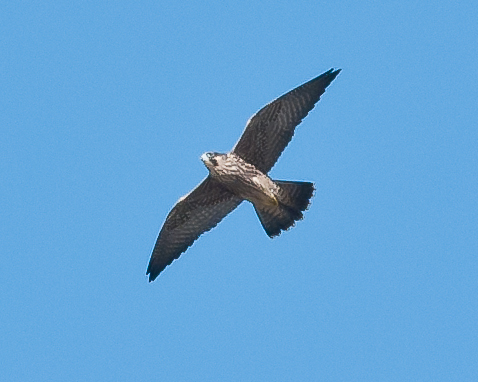 Young male buzzing the area. Could be Buzz. Dad got the adult meal at MacPigeon. He shared. 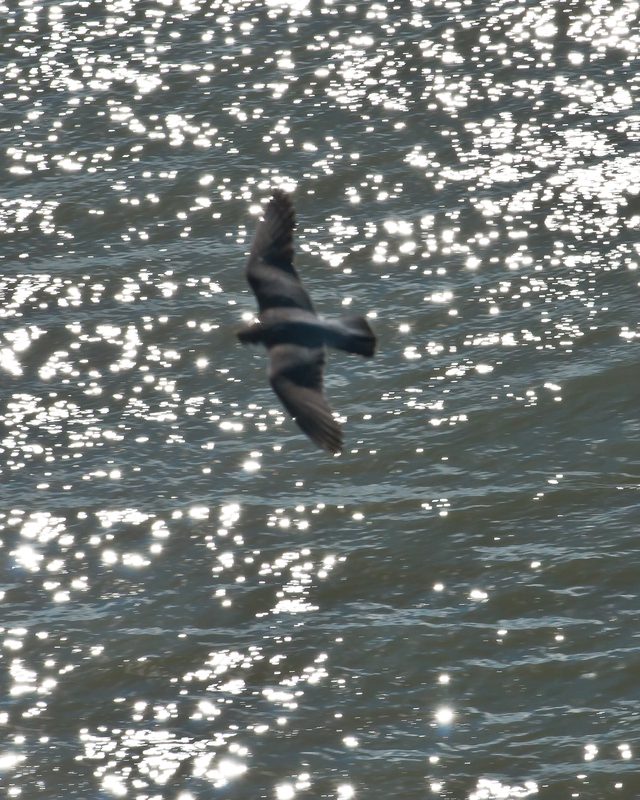 The Hudson River Glistens. 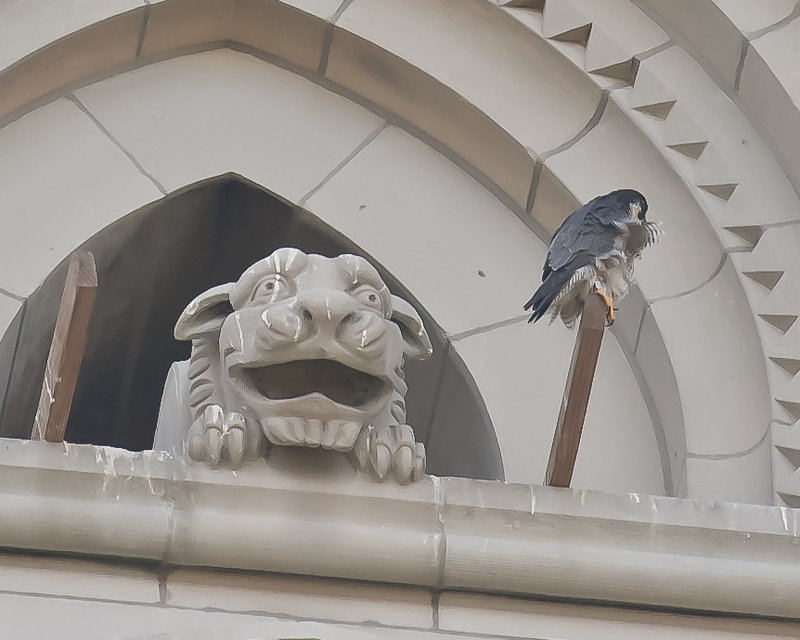 These peregrine falcons, Duck Hawks, are in the right place. Frank was full and just sat around. He watched Falcons in the City on his big screen TV. The family decided to watch, too. Now where did that other boy go? 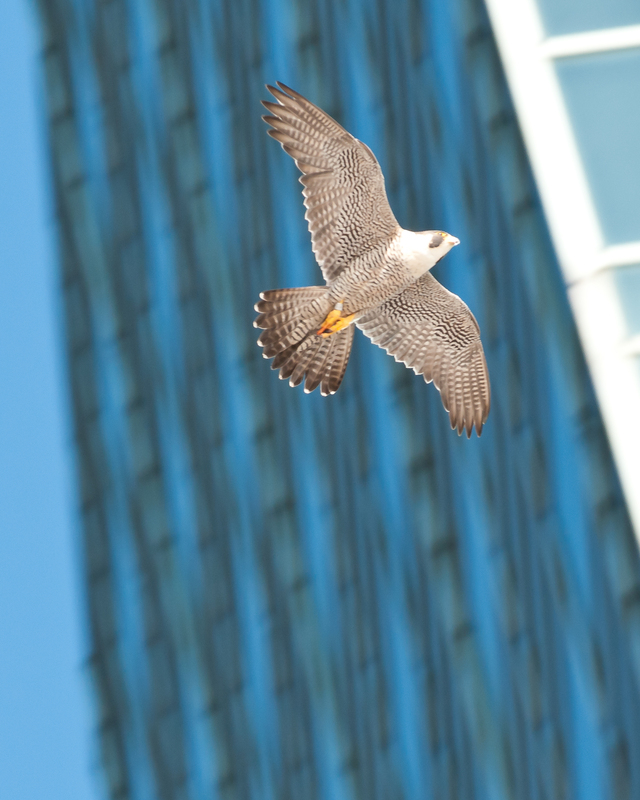 NOTE: We learned on June 26 that the female had perished in a collision with the building at 10 Exchange Place. Torrents of rain, high winds, TWO FLEDGLINGS!! 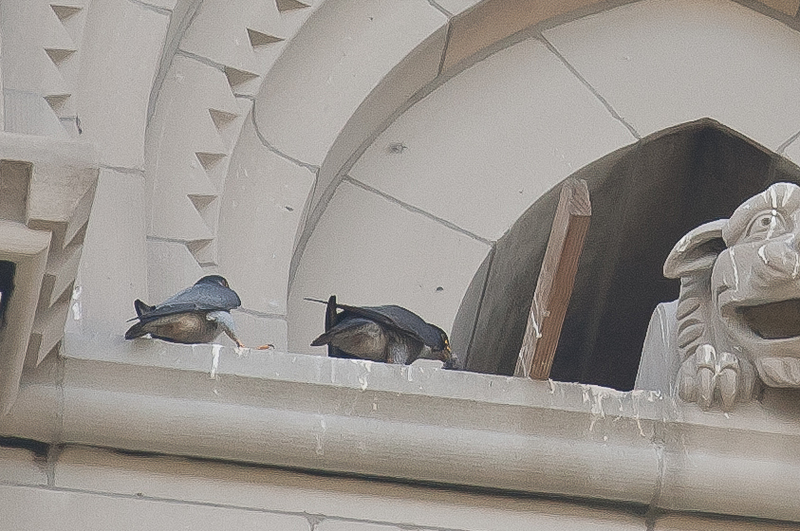 My friend, Mike, and I saw two of the young birds on Friday. They are agile. They are rambunctious. And they are alive!! 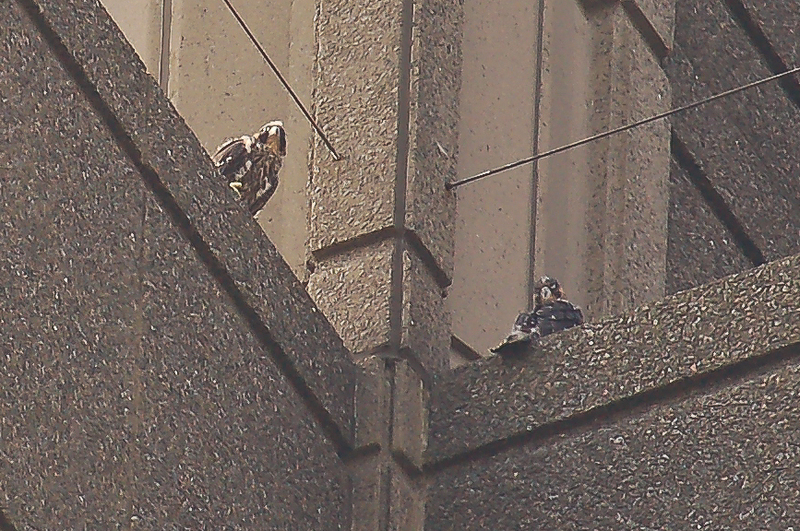 Both Athena and Six showed themselves as well. We knew they were keeping a very close eye on the kids. 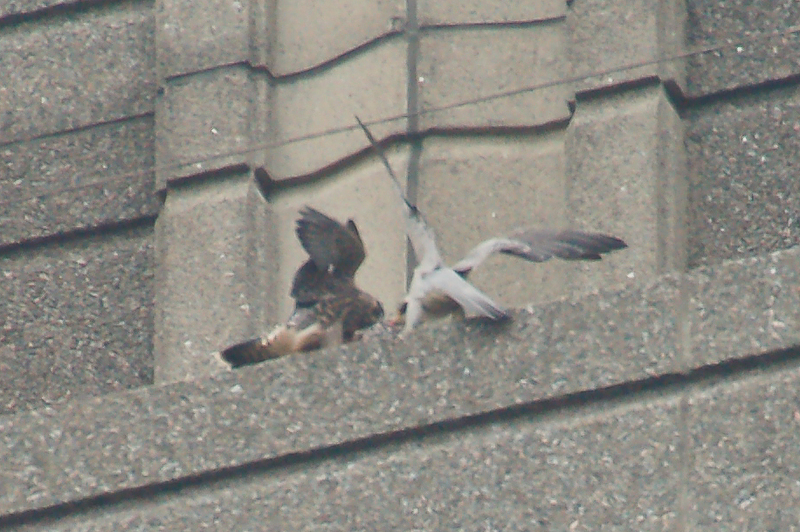 I am hesitant to say the male and female survived. 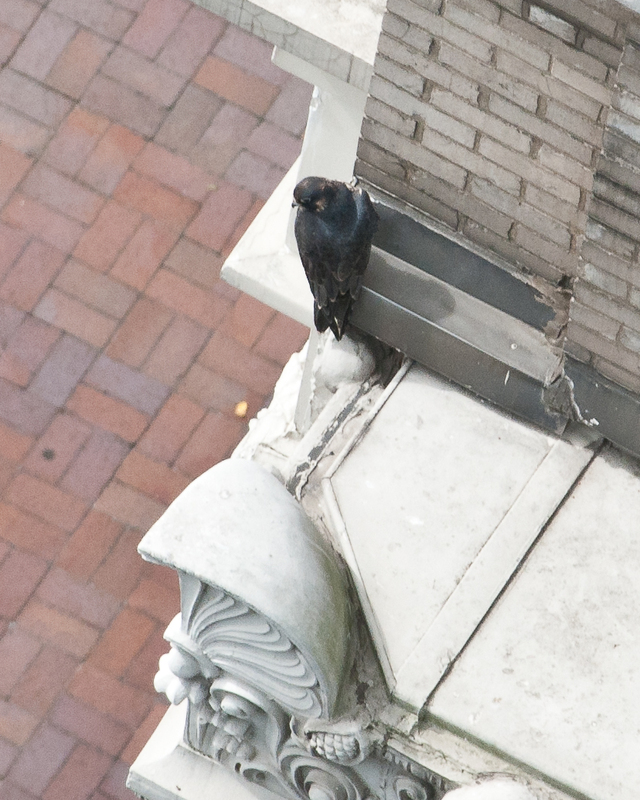 We have to wait for the band ID of the deceased fledgling found on Friday afternoon after three collisions at 10 Exchange that led to a traumatic fall. 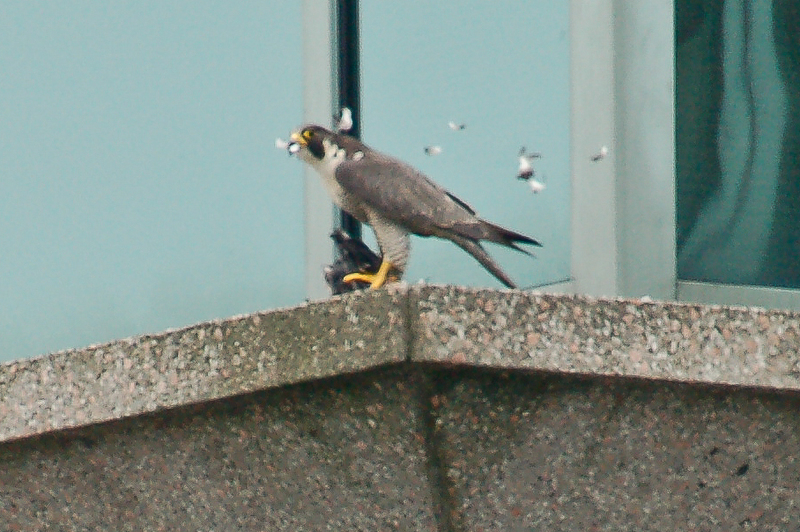 But one of the falcons we observed still had down on its leg and tail. 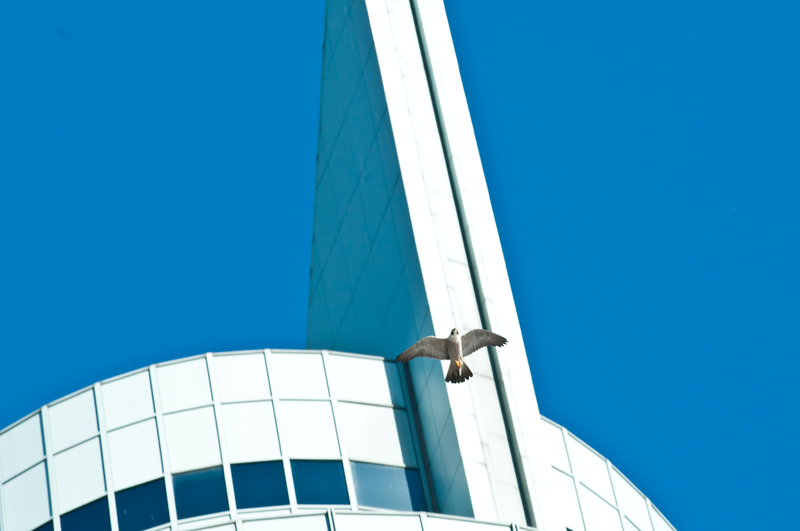 The family has now taken up primary residence at 10 Exchange, but they continue to use 101 Hudson. Wouldn’t it be nice to have TWO mansions right on New York Harbor looking over Lower Manhattan? 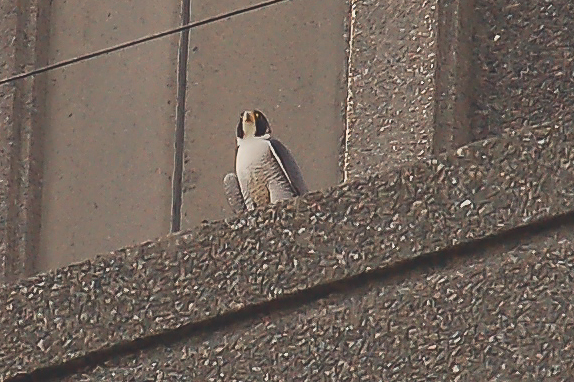 For all those watching and checking this blog from 101 Hudson and 10 Exchange Place, we are looking for the band numbers of the adult female. She only has a silver band. 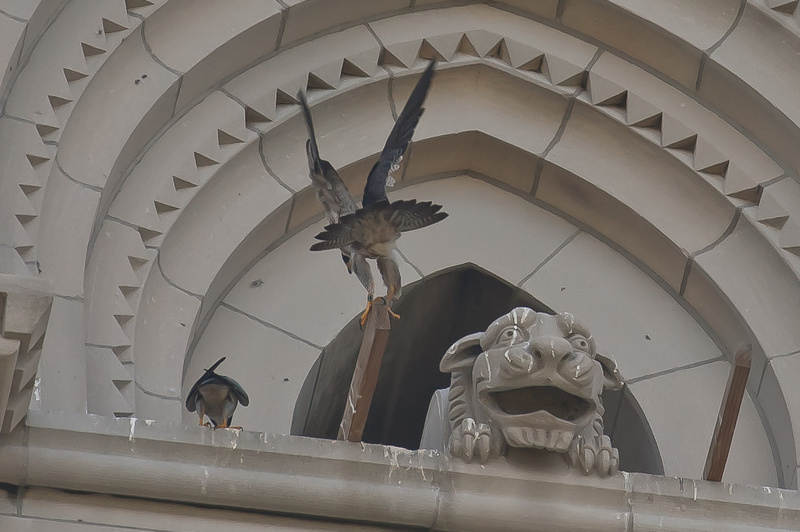 Six Pack, her mate, also has a black and green band with the number 06 (he packs a six and was hatched at Riverside Church). Please send pictures or band numbers. Thanks. 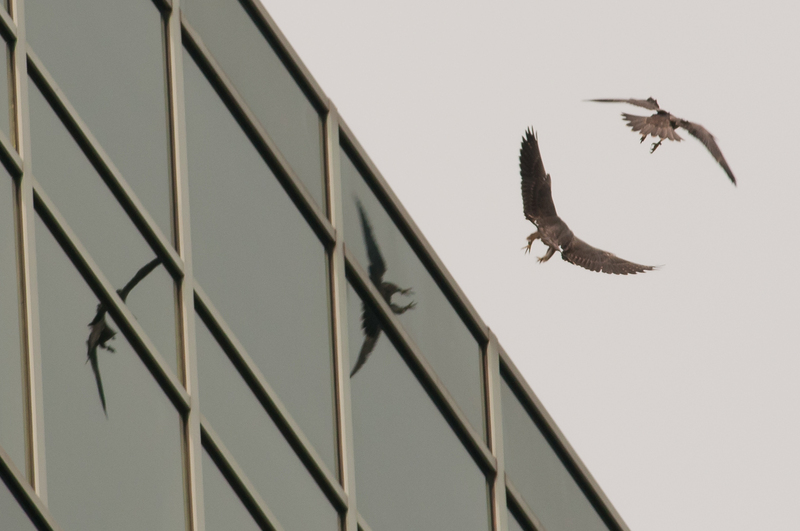 The fledglings enjoy flying with their reflections on 10 Exchange. But it is hazardous at best. More pictures to come. 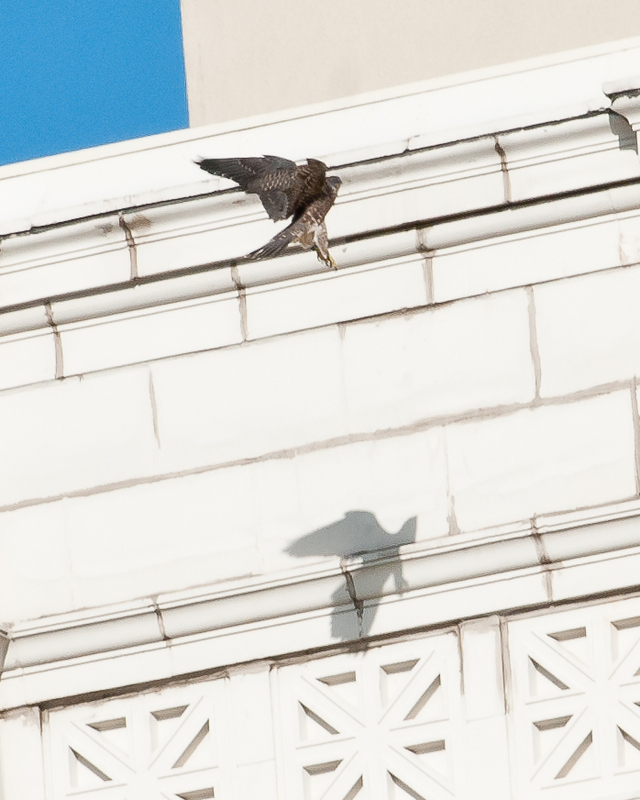 First picture shows the two fledglings on the 39th floor of 101 Hudson as I was almost underneath them lying on my back on the sidewalk underneath my camera and lens. 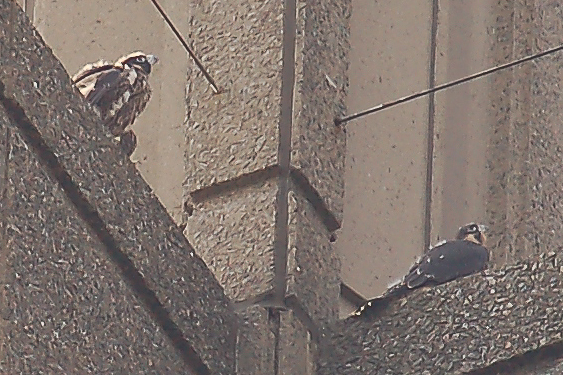 We never saw the third fledgling all weekend, but no news is good news. Since both adults were close by, we are pretty sure the third one was, too. 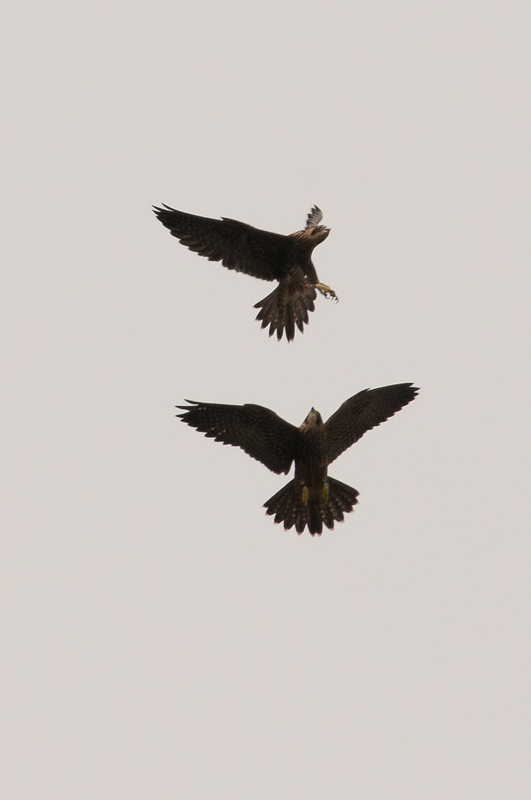 The adult male, Six (we had to name him), gave flying lessons to his (little) girl. My friend, Mike, was beyond ecstatic!! I couldn’t contain him. He went totally berserk. 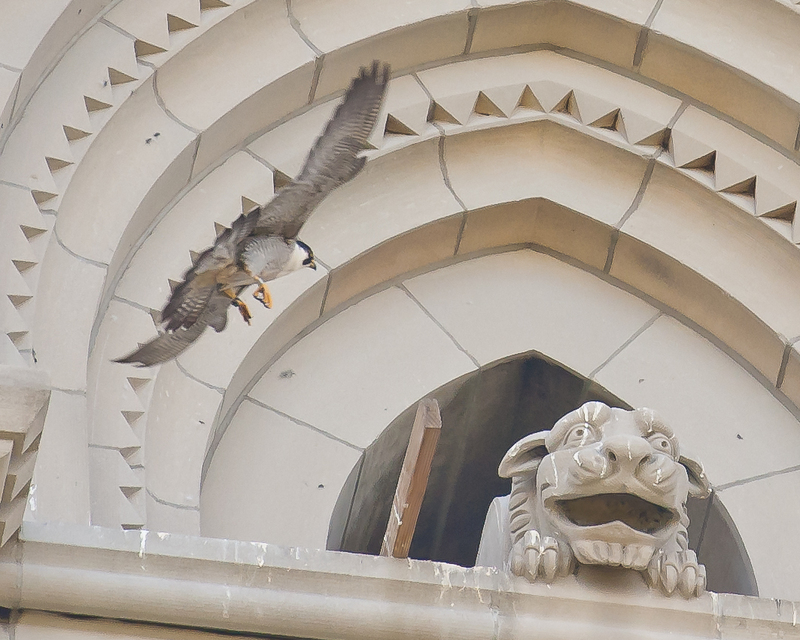 Have you ever had a peregrine coming at you at 200 mph? 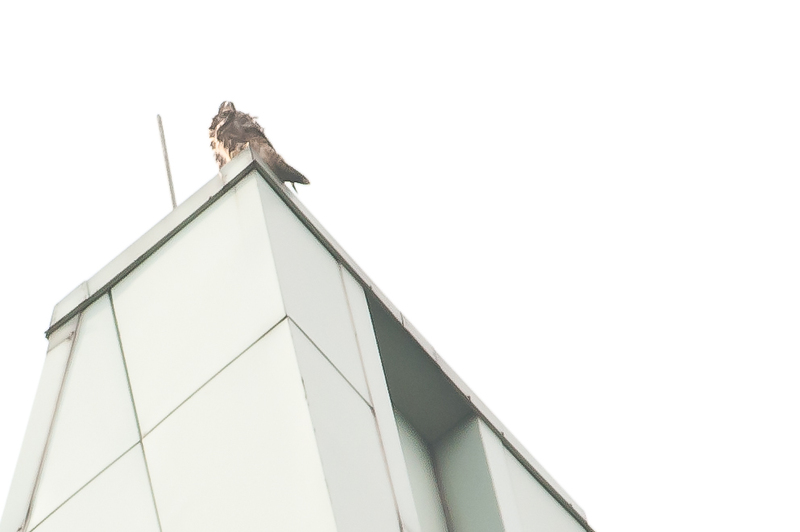 The adult female, Athena (we had to name her), came off the top of 101 Hudson. 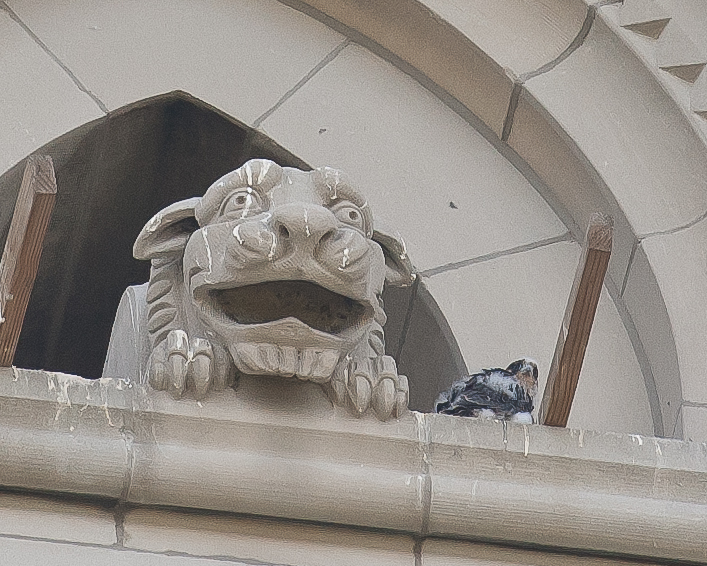 She barreled north on Greene for two blocks in a stoop and caught a huge pigeon right over us. 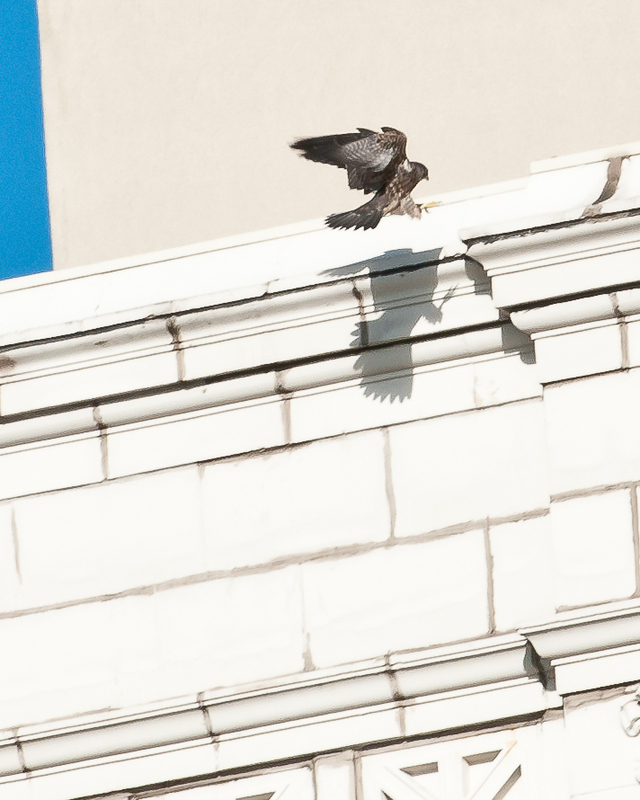 She could hardly carry it and circled over us before choosing the low terrace on 10 Exchange to prep it. She took it up to the scrape terrace for the kids. And what do caring, loving mommies do? Feed the kid some more, of course. Miss Fluff, named her, had an already bulging crop. Mom stuffed her some more. 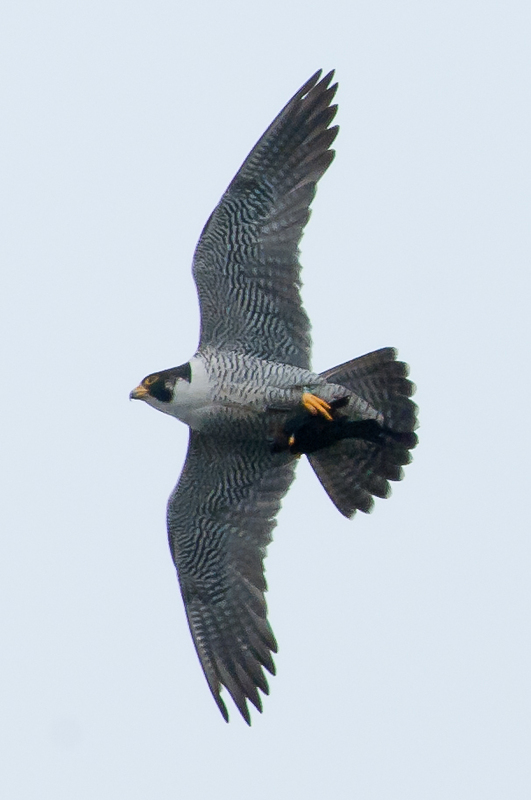 I guess this is also part of Falcon Training 101. 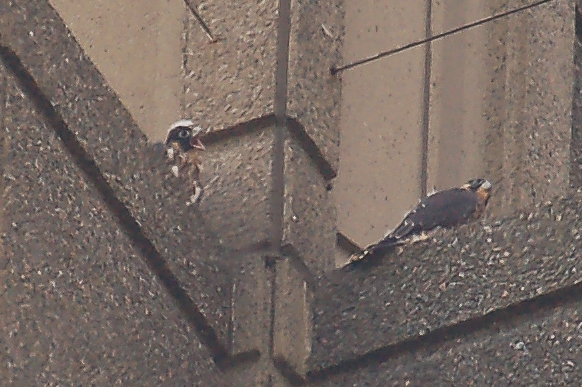 It is fledge time here in the NYC area. 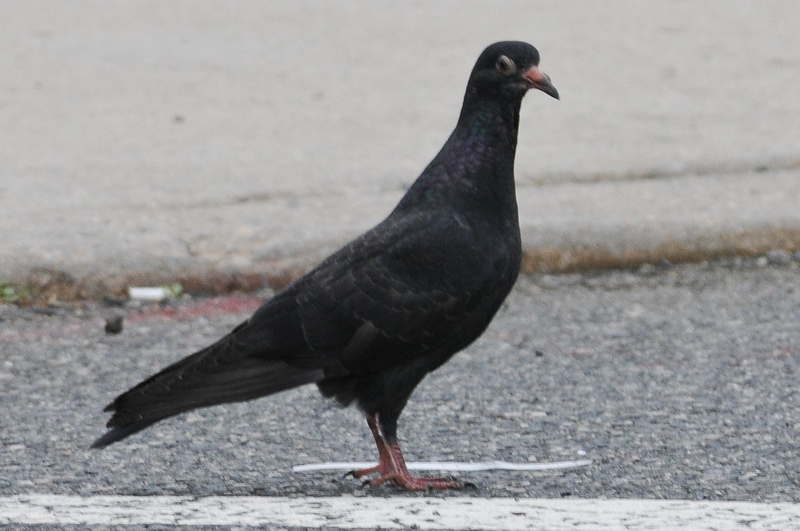 The gorgeous birds that call 101 Hudson in Jersey City their home are ready for the annual rite of passage. My friend, Mike, and I arrived at 8:30 am on a Sunday. 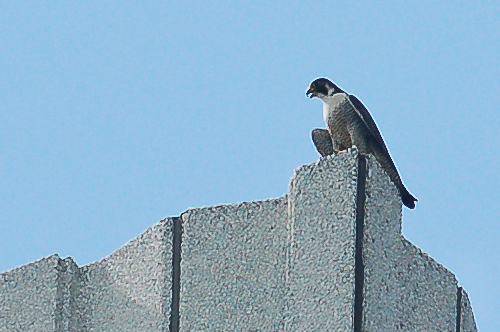 We saw one of the eyases on the ledge opposite the nest box and the two adults up on the top parapets. 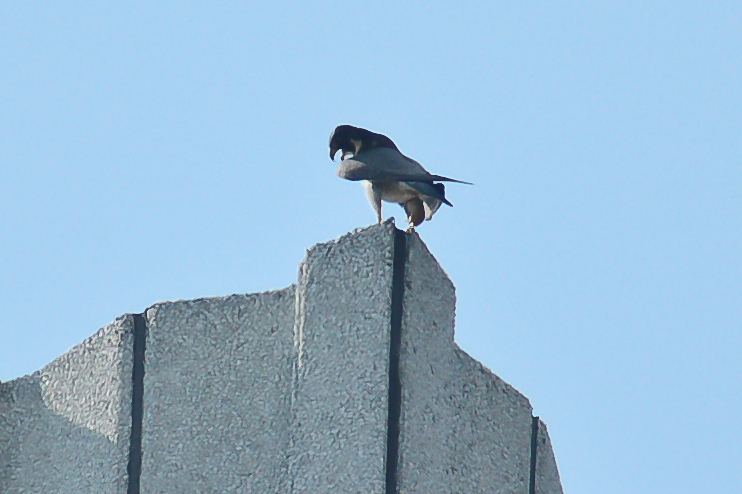 The youngster was voraciously chowing down. 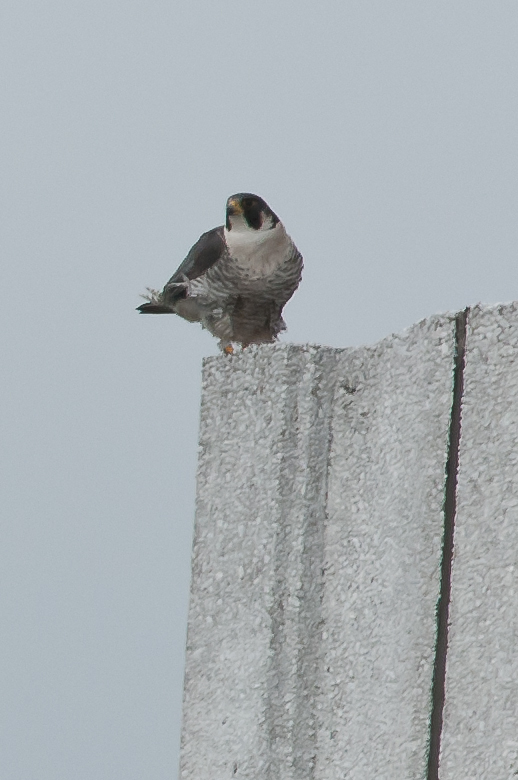 Shortly afterward the second eyas, a BIG female, hopped up to the nest box ledge. 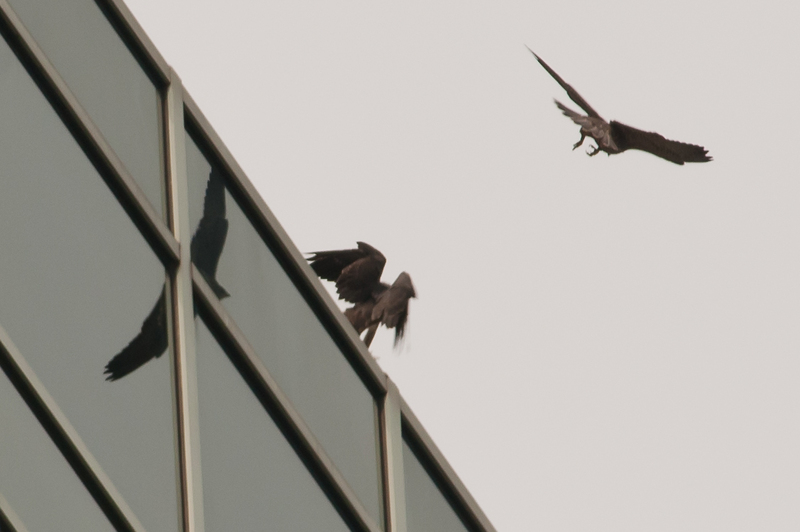 Both birds were close together in the shady corner of the 40th floor and the down was flying. 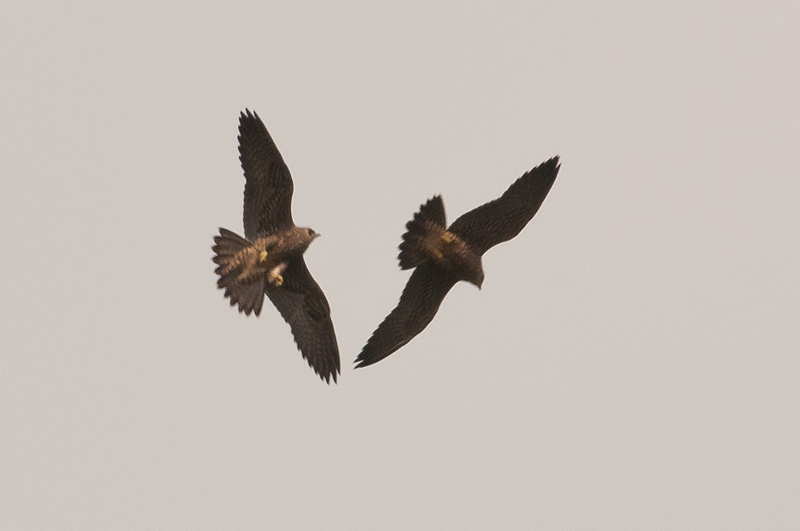 Suddenly the adults both took off at high speed to the west. 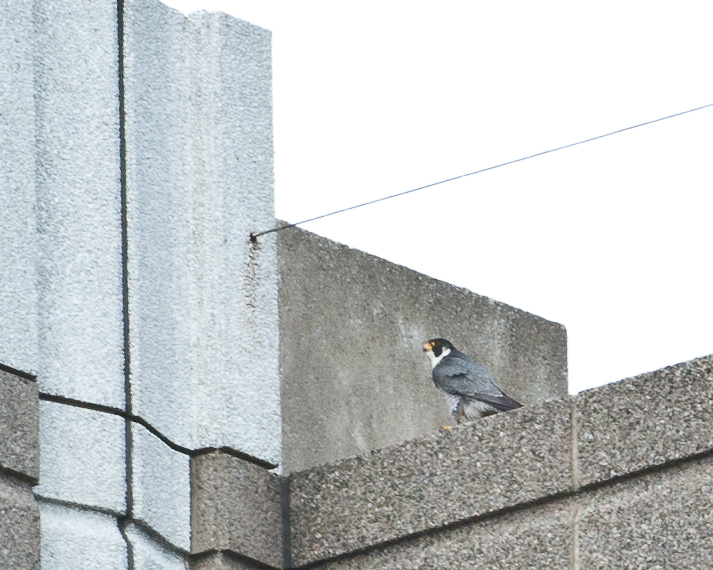 Then a third falcon appeared on the top parapet in the middle of the north side of the building. 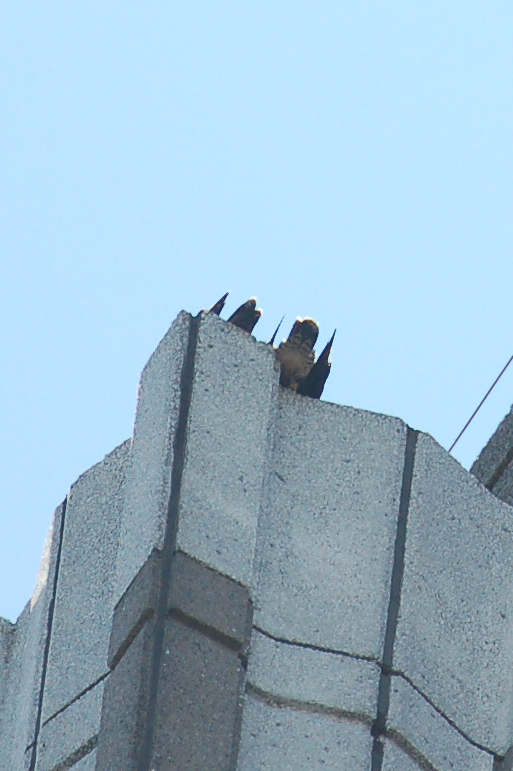 The adults dive bombed something on the roof. 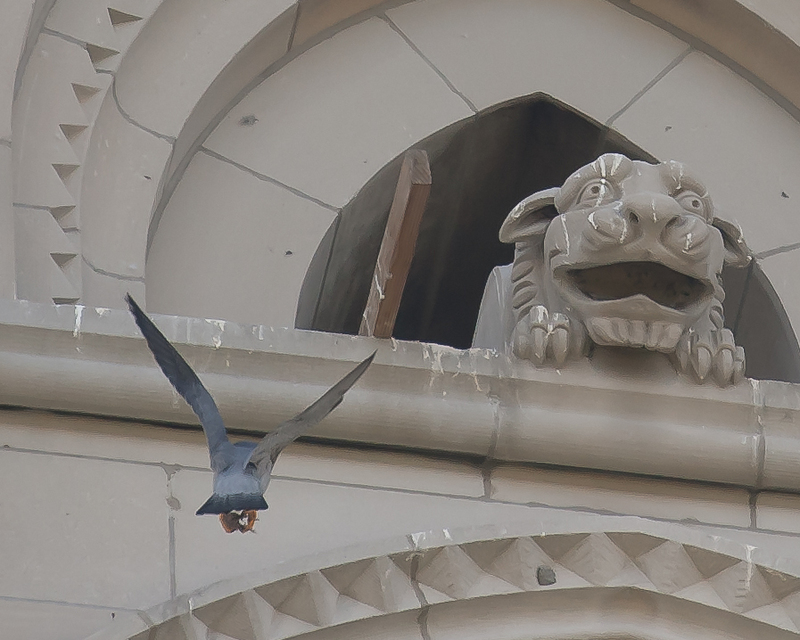 At first we thought it might be the fifth peregrine in view, but it seemed they were going after something more in the middle of the roof. 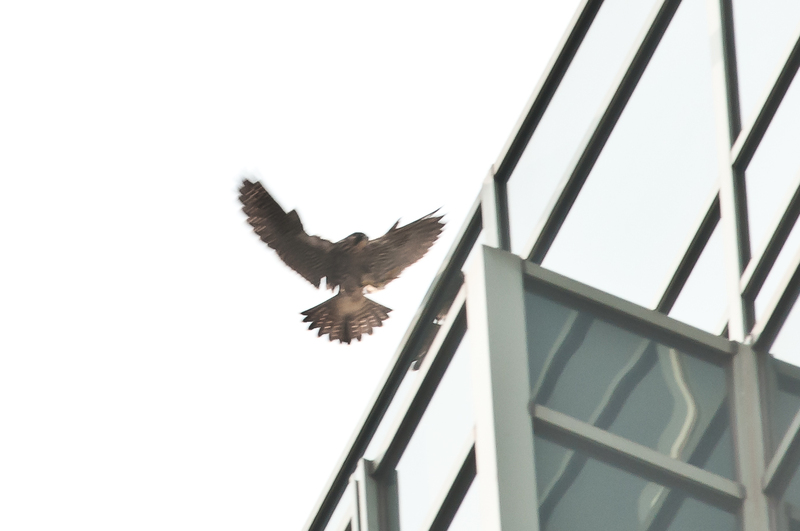 The fifth bird took off in a very wobbly flight to the west over the building, but we did not see it land. 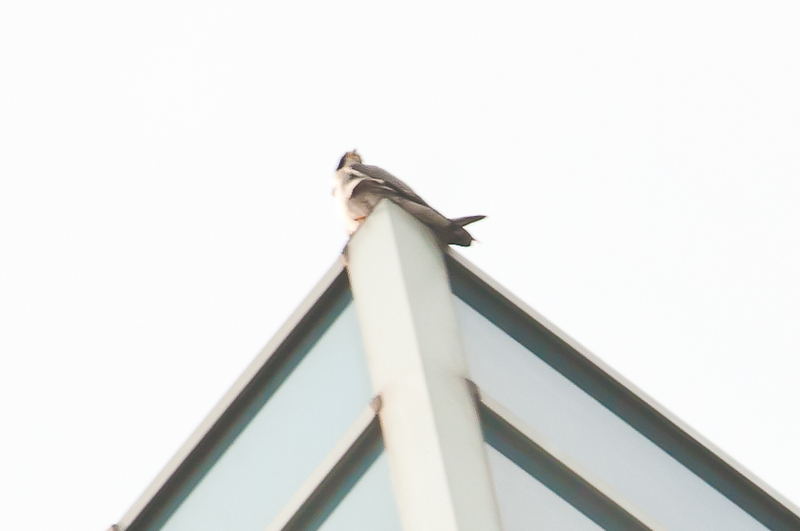 We are checking out whether or not we had the first fledge by one of the two males and someone in the building found the bird and returned it to the roof. No need to put a caption on the pictures. 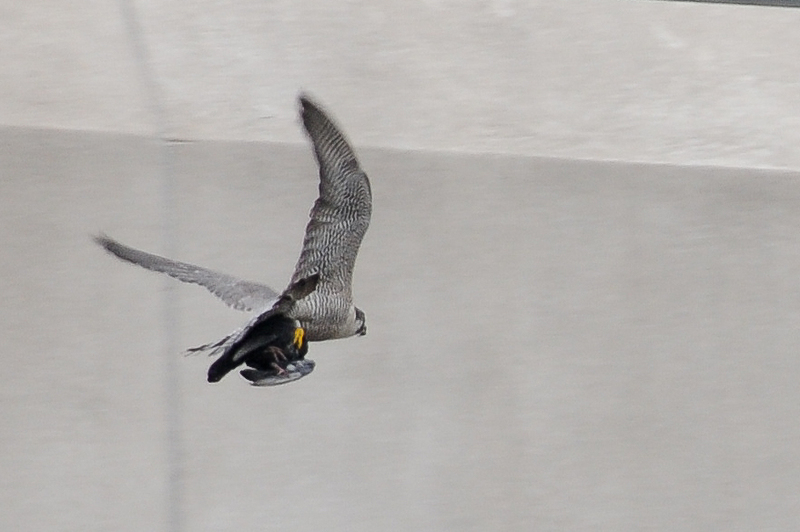 Pictures were taken two blocks away from the 7th floor of a parking garage. Yup, they are there and they have kid(s). 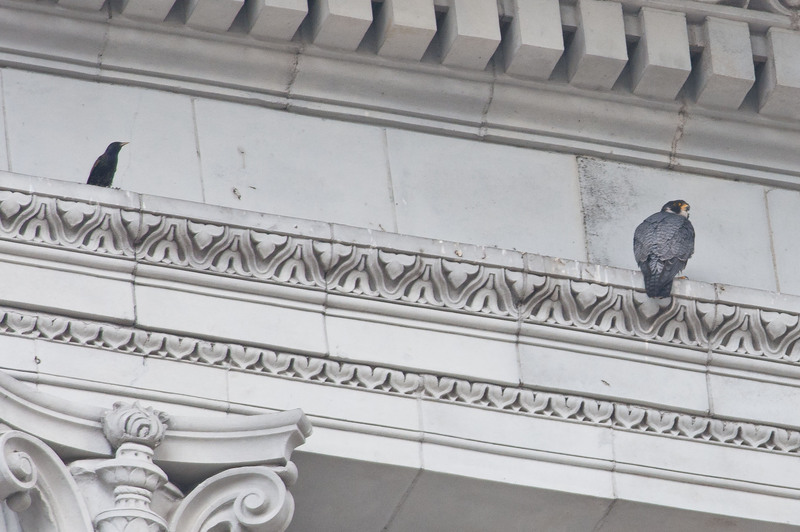 Saw at least one eyas peeking over the ledge. 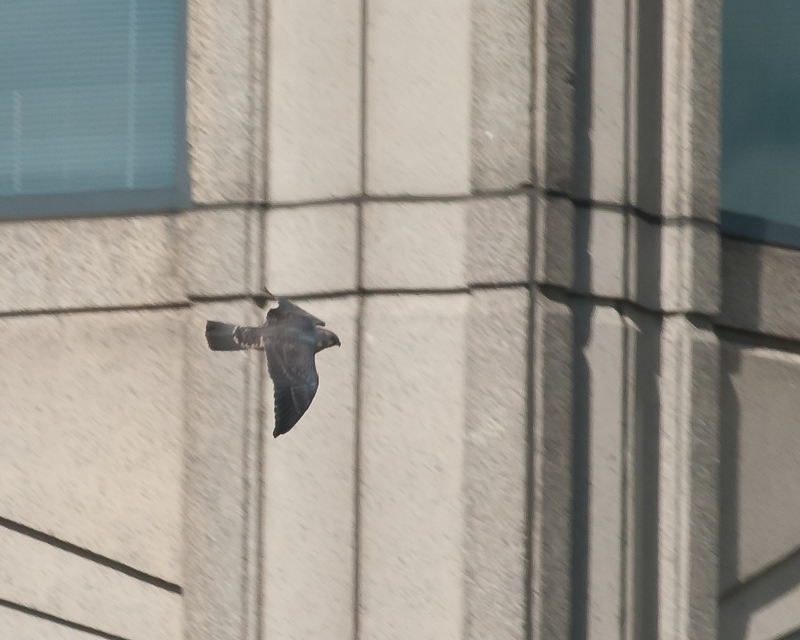 Thought I saw a flappy peregrine going after an adult. 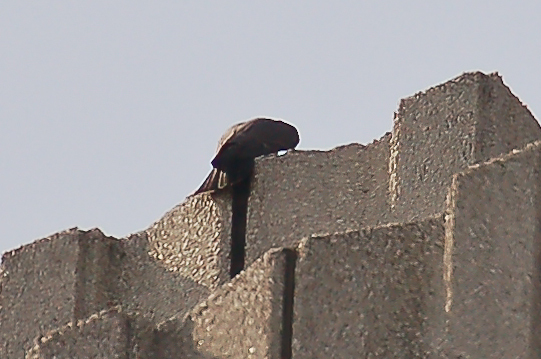 Don’t know if one fledged or not. 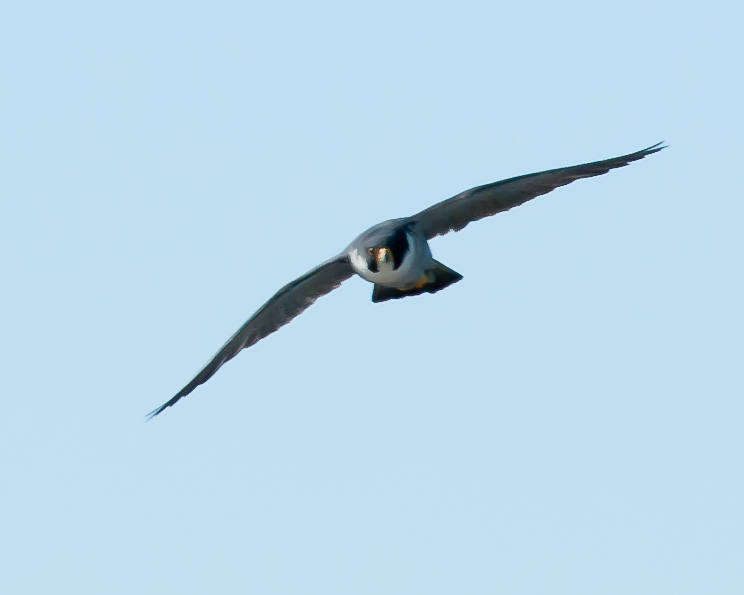 Adults made many photogenic fly overs. 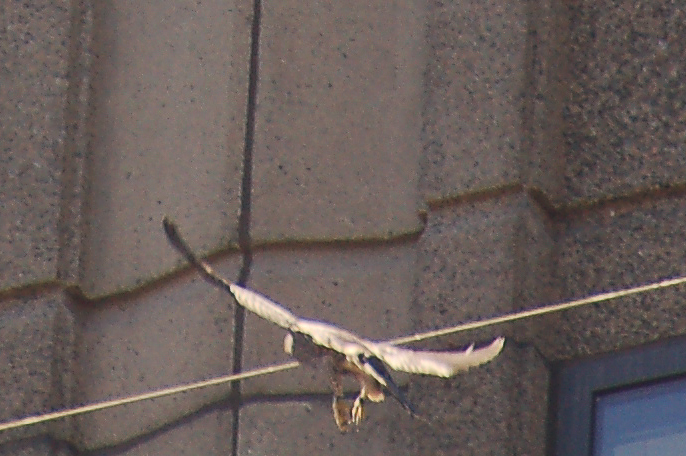 And they escorted an osprey out of the area. No pics of that one, darn.